For Sale in Cornwall for Asking Price £950,000. This stylish four bedroom house set of four storeys is truly stunning and has been recently renovated to an exceptional standard and specification. The property provides light and airy accommodation with a contemporary open plan living space, four boutique bedrooms and luxuriously appointed bathrooms. 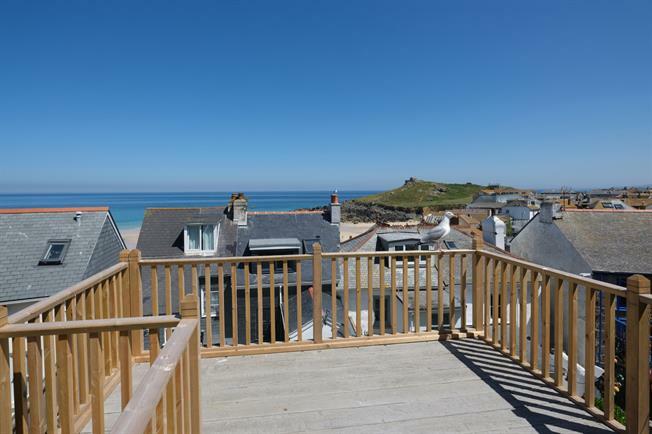 Spectacular sea views are enjoyed from the property and the several terraces at the rear, with BBQ areas and cosy seating areas a perfect spot the gorgeous sunsets over Porthmeor Beach. An impressive entrance hallway with tiled flooring, heating radiator, double glazed window to the front, built-in seating and shelving, part panelled wall, inset spotlights and carpeted stairs rising to the living area. A useful utility cupboard with space for a washing machine and tumble dryer. A luxuriously appointed wet room, shower area with a glazed side screen, fixed head shower and separate riser rail, wall mounted w/c with a concealed cistern, semi pedestal wash hand basin with monobloc tap, tiled floors and walls, LED spotlights, heated towel rail, extractor fan. A stunning contemporary kitchen with Corian style work surfacing over, an extensive range of base units with island unit, under slung stainless steel sink with feature monobloc rinser tap, oven, hob and extractor fan, integrated fridge and freezer, dishwasher, display shelving, inset spotlights, tiled flooring. Dining area with tiled flooring, fireplace with inset stove effect fire, recessed shelving with exposed stone detailing, double glazed atrium roof and double glazed sliding patio doors to the rear. Double glazed windows to the front enjoying sea views towards Porthmeor beach and The Island, fitted carpet, heating radiator, feature papered wall, tv point, fitted wardrobe, inset spotlight. Double glazed window to the rear, fitted carpet, heating radiator, built-in wardrobe, inset spotlights. Double glazed window to the front enjoying sea views, fitted carpet, heating radiator, built-in bunk beds and shelving. A luxuriously appointed bathroom fitted with a double ended bath, a wall hung w/c with push button flush and concealed cistern, vanity unit and wash hand basin with monobloc tap, tiled floor and walls, shower cubicle with glazed screen and door, fixed head shower and rinser, heated towel rail, mirror, extractor fan, inset spotlights, obscure double glazed window to the side. A superb en-suite fitted with a wall hung w/c with push button flush and a concealed cistern, semi-pedestal wash hand basin with monbloc tap, tiled floor and walls, mains shower, heated towel rail, double glazed roof window.